When the queen of a small kingdom dies without leaving an heir, the mourning citizens are confused. Who will be their next ruler? The royal scrolls state that if there is no heir – no children, no siblings, no aunts or uncles – the queen’s best friend must take her place. It just so happens that the queen’s best friend is Lucy, her beloved beagle. The evil Lord Runcible is furious at the thought of a canine queen and plots to seize the throne for himself. So begins a battle of wits between man and dog. A suspicious flea infestation, a dog-napping and an icy cold dip in a river all form part of a thrilling adventure. Will Lucy be able to prove to the people that she is worthy of the crown? 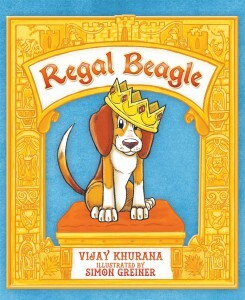 Regal Beagle is available in all good bookshops in Australia. or get other ebook and real book versions here.